For over two weeks, the Gaza strip (already besieged for the past 7 years) has been subjected to continuous bombardment from air and sea. This is the third war to be waged on the strip in the span of 5 years and it is more than likely going to be the deadliest. 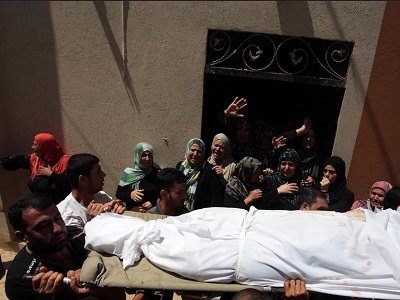 Approximately 800 Gazans, mostly children and women, have already been murdered. In the past 10 days, the Israelis have added their ground force to the fire power, using heavy caliber artillery and tanks to shell the densely populated strip, compounding the suffering of the population and increasing the scope and space of its ongoing massacre. For those living in Gaza, language cannot depict the scale of the tragedy. Many families have lost all or most of their members. As one health official in Gaza said, “Entire families have been wiped out of the civil record.” This doesn’t seem to be the result of simple failure to observe the principle of “disproportionality,” but rather an evident disregard for life. Nowhere seems to be sacred or safe in the face of an onslaught, where residential areas are considered legitimate targets. Mosques, hospitals, ambulances, medical teams, UN run schools and children playing soccer on the beach have all been targeted. The images look barbaric enough for anyone viewing, not experiencing them. But for the Palestinians, this is not the first time they find themselves before this ordeal. For the past 60 years, Israel has been slaughtering Palestinians wholesale with impunity. Ordering or participating in killing, displacing and dispossessing Palestinians are amongst the few things that any successful Israeli politician would have done at one point of his/her public career. As a nation, Israel was created by that very process of decimation, dispossessing, and displacement of Palestinians. Gaza is a living testimony of that process. Most of its residents, who have been starved for the past 7 years and now bombed, are families who were originally forced in 1948 and 1967 to flee their hometowns and villages, which were subsequently annexed by Israel. Contrary to the image of an Israeli victim of Arab terrorism, which many Western politicians allege, what is indeed taking place is the reverse. The suffering of the Palestinians as a result of the terror of the Israeli state is immeasurable. Beyond death and dispossession, generations of Palestinian children have been forced to endure unbearable psychological scars, as they were made refugees time and again. Despite this, it is the Palestinians who are seen to be responsible for the war by much of Western media and the official rhetoric emerging from most Western capitals. In the face of the enormity of the Palestinian suffering, Western leaders (such as US Secretary of State John Kerry, UK Foreign Minister, Philip Hammond) have chosen to blame the victim and side with the oppressor. In siding with the oppressor, these leaders invoke Israel’s right to self-defense. However, the facts on the ground don’t support this claim. A close look at the figures of the dead and the injured suggests the exact opposite. Israel is committing genocide, not engaging in self-defense. In the past 17 days of the one-sided onslaught, there are over 780 Palestinians who were killed in targeting residential areas in Gaza. Over 4,000 have also been injured. The figure of internally displaced Palestinians has surpassed 120,000. The figures on the Israeli side are lower. Only dozens were killed and injured. The difference in both cases is not just in the asymmetry of the death toll. The nature of those killed is also indicative of the kind of conflict we are witnessing and the level of deception in the comments and communiqué issued in Western capitals about it. Of the Israeli fatalities, 94% are military personnel (30 out of the 32 are soldiers). Most of those injured are soldiers as well. The ratio of combatant to civilian death on the Palestinian side is starkly different. According to the UN and the health services in Gaza, over 80% of those killed in Israeli raids and continuous shelling are civilians and one third are children. The UK Telegraph has recently published the names of 132 of these children. Today this number has risen to 181 according to UNICEF. The genocidal nature of this onslaught is also clear from the circumstances of death as well. All the Palestinians killed, so far, were killed inside Palestinian borders, within residential areas and often as they stayed in their homes. In contrast, all Israeli fatalities (except two, the total number of those died as a result of rockets fired from Gaza) were engaged in combat. Given the asymmetry of death, of the ratio of civilians to militants, and given the Israeli unchallenged dominance of air and sea space, it is genocide or ethnic cleansing that is more befitting descriptor of what Israel is doing in Gaza. Western leaders’ argument that Israel is defending itself is simply not supported by facts. It is morally reprehensible and inexcusable. The Israelis claim that they are trying to neutralize the rocketry of the Palestinian resistance, which target Israeli towns. This claim is further strengthened by a corollary claim that Hamas, which runs the strip, is a terrorist organization. 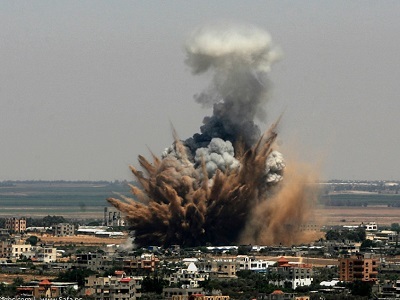 Western and Israeli leaders allege that it targets civilians. Today, the UK Foreign Secretary, Philip Hammond, speaking in Cairo, repeated the same claim and blamed Hamas for starting this round of conflict. But these claims are neither true, nor do they justify the savagery of the current onslaught on Gaza, where civilians, women and children, not rocket launchers are bearing the brunt of the assault. The insinuation that Hamas has started this round of conflict is a lie. The current round started after three Israeli teenage settlers (one at least of whom was a soldier) were kidnapped and later found murdered. Although the event took place in the West Bank, and although no Palestinian group claimed responsibility, Israeli government immediately pointed fingers at Hamas. Hamas has denied involvement, knowledge of the teenagers’ kidnaping or who did it until it became news. Some press reports have pointed out that Israel deliberately misled its public and knew of the of the victims’ deaths and whereabouts days before it made that information public. A recent report in one German channel suggests that the Israeli government simply used the event as a pretext to attack Gaza. Despite its knowledge of the teenagers’ death, the Israeli government continued to raid and arrest Palestinian activists under the pretext that it was conducting a search for the abducted. In the process, Israel arrested hundreds of Palestinians and killed a dozen. Many of the arrested were prisoners who were originally freed as a part of a prisoners’ swap with Hamas in 2011. This was not only a breach of the terms of the prisoners’ exchange but a clear provocation to involve Hamas. To add more fuel to the fire, Israeli settlers kidnapped and burned a Palestinian boy alive. It is within these circumstances that the resistance groups in Gaza began firing missiles toward Israeli cities in retaliation to the collective punishment, mass arrests and killing of Palestinian activists. Beyond the immediate context, Israel deliberately breached the 2012 ceasefire brokered by Egypt, which mandated Israel to lift the siege on Gaza. Israel did the opposite. It tightened the siege. Since the fall of Morsi, Egypt joined Israelis in the effort to isolate Gaza, closing its borders, making the already unbearable situation catastrophic. It is now the position of the Palestinian groups that Israel must first cease its onslaught on Gaza and honor its earlier agreements. Quieting the missiles in Gaza, without lifting the siege, will only mean more suffering to the crowded strip. Israel’s choice to violate its agreements and to focus its military campaign on residential areas is what defines the current conflict and manufactures the tragedy. The solution therefore lies in integrating Gaza through trade with the rest of the world. The notion advanced in an article published today on the Foreign Policy’s website that Israel is compelled to pursue “an eye for a tooth” policy to establish deterrence is not only a disingenuous attempt to make palatable the cowardly mass killing of civilians. It is misguided in essence as well. Israel has exhausted all violent means to force Palestinians to submission and has so far earned neither rest nor reverence. Deterrence has always been an Israeli policy objective and has always failed. Despite its disproportionality, and Western praise of its efficient military establishment, Israel is not safer today than the time when it pursued deterrence against Palestinians armed mostly with stones. Rather than being a constructive course that would contribute to a peaceful future, Israeli attempts to bomb Palestinians to submission is only going to create further risks for its future generations and diminish the prospect for any peace. It is relatively cheaper for the Israelis to withdraw from the Occupied Territories in 1967 and to stop besieging Gaza from sea, air and ground. Despite the factual errors about the 2006 war on Lebanon in FP’s article, the allusion to a parallel with Gaza is a stretch. Unlike Hezbollah in Lebanon, who kidnapped soldiers to trade for its prisoners in Israel, an objective it successfully achieved, the Palestinian Resistance is driven by a much bigger and, for that matter, a more just cause. Resistance against occupation is enshrined in all laws and highly regarded by all cultures (including the West whose moral superiority the FP’s article praises), and it is not going to stop regardless of what the outcome of the current killing spree in Gaza is. Israel’s deterrence has been eroding and whatever moral claims it had is also vanishing into thin air with every child blown to bits and pieces by its artillery or bombers. That trend will continue. The Palestinians do not stand alone and the Israeli brutality will only rekindle the anti-Israeli sentiment in the region. The fact that many of the neighbors are either busy in their own civil wars or are shackled by despots is not a guarantee of a stable future. The region is going through a radical change, and within a decade, Israel will be fully surrounded by actors who are not fettered by fear of loss either of lives or infrastructure. Nor would these societies of warriors be shackled by the international conventions, which the Israelis and the Western governments backing them make mockery of at the moment, feeling that military superiority makes them beyond reproach. What Israel is sowing today, it will surely harvest tomorrow, and no amount of pontification from Western missionary professors, driven by a contradictory mission to on the hand justify mass murder and on the other hand flaunt the supremacy of Western war ethics, will be of much use to them. – Ahmed Meiloud is a PhD student at the School of Middle Eastern and North African Studies at the University of Arizona. His research interests include studying the various movements of political Islam across the Arab World, with special focus on the works of the thinkers, jurists and public intellectuals who shape the moderate strands of Islamism. He contributed this article to PalestineChronicle.com. The word “genocide” seems to have had its definition altered. Typically, in a genocide, the targeted-group’s population decreases, rather than increase as has been the case in Gaza. Boaz, did you realize that you’re using the same argument of the Holocaust deniers, when they say their bla-bla about the numbers of Jews who used to live in Europe before the time of Hitler’s mass murders…? Food for thought for us about the nature of the likes of you, my dear Nazionist. Andrea: In your desire to spit Jew-hatred at Boaz, and unleash your oh-so-clever and increasing witty slur, “Nazionist”, you failed to attach any real argument to dispute what Boaz wrote. In fact, in a genocide, which includes the Rwandan Genocide, the Armenian Genocide, and the Holocaust, you don’t see the population increasing. Rather, you see it decreasing, and at a rate which makes the extermination of the local ethnic group at least possible. That is why 6,000,000 (Holocaust) is a number consistent with genocide, whereas 1,000 (Gaza) which is 1/6000th, is not. Consequently, the number of Jews in Europe did drastically decline, whereas the Gazans are drastically increasing. Quit shooting rockets during cease fires! Not very smart. All of you Palestians are in my pray’s and soon all the hyenas will no longer exist.Amen. Every Arab terrorist killed is one less barbarian. Simple maths. Keep on murdering, Jew Nazionists. YOU and only YOU have the heart of Adolf. You are in the same side. The only difference is your target. Every free humanist is an israel’s enemy. Every human being is a Palestinian (as in WWII was by the nazi’s victims side). Keep on spielbering and enjoying the myths of 9.11 (mossad motion pictures).